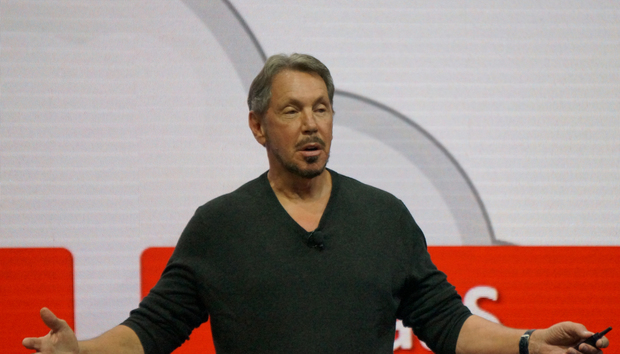 Oracle CTO Larry Ellison ordered himself some new business cards on stage at the company's OpenWorld conference in San Francisco on Sunday, just by having a conversation. As part of his keynote address to attendees, Ellison took the time to show off a new set of tools for creating intelligent chatbots that integrate with Oracle's software. It's aimed at making it easier for businesses to build bots that let users connect with their enterprise software, and help businesses connect with consumers. Chatbots are a hot topic in the tech industry, with companies like Facebook, Microsoft and Slack all building tools that companies can use to create intelligent, automated conversation partners. Their growing popularity comes down to a few factors, including the proliferation of smartphones, fast internet connections and messaging apps. Part of their appeal is that it's a way for people to interact with computer systems without having to learn a new interface beyond the messaging apps that they're familiar with. For companies trying to reach a younger generation of users, it's an appealing prospect. Oracle’s tools are supposed to work with bot platforms like Facebook Messenger, Kik and Slack. Ellison showed a Facebook Messenger bot that he built on the iPad to connect with Oracle HCM software and help with procurement. When Ellison typed in a request for business cards, an image popped up showing a business card that still listed him as CEO. The bot said that it was a previous template, and that he had a different title in Oracle’s HCM system. "Thank god I didn’t check my salary! That could have been really bad," he said as the notification popped up on screen. "You know, it wasn't just my title that changed, folks." The bot asked Ellison if he was okay with making the title change before continuing. "Well actually not, but what the heck, what’s done is done, and I would actually like to order the new cards," he said. A bot like that one could allow employees to do all manner of things within a company, Ellison said. In addition to ordering business cards, it could be used to schedule meetings and procure more expensive pieces of technology like a laptop or iPad. One of the big questions hanging over platforms like Oracle's and others is whether or not people will actually be interested in using all of these different bots. While intelligent assistants like Siri have increasingly become a part of how people use their smartphones, it's still an open question whether that'll translate to a world where conversations with bots become a natural part of our everyday lives.